I first discovered the concept of recreational reading thanks to Star Trek: The Next Generation novels. Before a family member gave me a dozen of them as a present one year I thought reading was something teachers assigned you to do, whether you liked the books or not, and forced you to write a report on. And no matter how much I liked a book before I started writing that report, by the time I had proof-read it a dozen times and tried to make sure the teacher would be happy with it, the book that had spawned the report was now my least favorite book on the planet. I devoured the dozen books during a holiday break from school, a book a day with characters I knew and loved. Dialogue that had laugh out loud moments. A variety of authors with different styles, and different approaches, and yet at the core the values were the same… and of course, the characters were consistent across the books. It was, quite simply, eye-opening in a variety of ways. I could read, for pleasure! Multiple authors could tackle a set of characters I enjoyed week after week on the screen, bring them to the page, and give me compelling stories. Suddenly I wanted to make time to read, instead of dreading it. I found myself looking back at books I had read for school in previous years, and recalling the portions I had enjoyed — before I had sat down to write my dreaded reports. For years I picked up every Star Trek: The Next Generation novel as it came out, in part because each reading experience reminded me of that first one. Even as I was continuing to read the trek books (and getting Peter David’s New Frontier series of novels) I was discovering other genres were fun to read! Not all reading was a chore, and part of school. To this day, when parents bemoan having a child who does not enjoy reading, I encourage them to keep looking for the right book to trigger that love. The first time I picked up a Star Trek book by Christopher L. Bennett I read the back cover and was positively intrigued. I was no longer getting all the books, they had moved into story-arcs that moved between the series, and more complex stories than I could devote myself to. I had reached a point I never thought I would — I now pick and choose among the Star Trek books. I read Watching the Clock and loved Bennett’s use of time-travel in the Star Trek universe. As I read Forgotten History I found the title all too appropriate. The novel inspired a desire in me to go back and re-watch about half a dozen Star Trek episodes, read some of the Star Trek original series novels, and simply refresh my memory on the continuity of the Star Trek universe. I found there was a lot of Star Trek history I had forgotten, or was not positive I was recalling. The story was so well told, I was confident the author was playing fair, that when he laid something out and assured me I had seen this, I had… and yet I wanted to go look. Bennett sparked my curiosity, drew me in, and had me marveling at the way he took a dozen separate works from the Star Trek universe and wove them into a coherent history. Suddenly all the time travel of the television series character James T. Kirk’s life and times made sense! 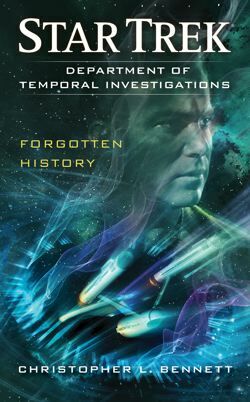 Forgotten History is clearly written by someone who loves the Star Trek universe, for an audience who loves it as well. By the time I reached the end I was wishing my memory for all things Trek was sharper, that I was better versed in The Original Series, and that I was not sitting on an airplane flying away from my home. In part because I had a long mental list of all the scenes I wanted to re-visit! Then I read the acknowledgements at the end of the book! What a wonderful and kind author to give a summary of where the re-visited events come from! Let me clarify, he does not regurgitate scenes you have seen before. He does not put into prose what was on the screen. Having not yet had a chance to review the episodes, I believe Bennett shifts the perspective to that of his characters, adds moments that were not on the screen, and fleshes out the story of time-travel in James T. Kirk’s life such that suddenly all those little tidbits and occasional scenes flow together into one logical story, because for the agents of the Department of Temporal Investigations those events happen in a forward progressing manner creating a story that moves from start to finish. I would liken it to a television episode that looks like it is going to be a flashbacks episode of clips, and yet, as you watch, you realize they filmed brand new material for the episode and are creating the illusion you have seen it all before because they are re-shooting familiar scenes from the perspective of someone else, with additional characters and material. Do not be surprised if this book makes you stop and think. Pause and recall moments of sitting in front of your television set on days gone by with friends and family, engrossed in an episode of a show you have long loved. That is part of the magic of the reading experience. The holes it fills in, and the memories it draws to the foreground. I found myself stopping periodically simply to take in all that I had read, recalled and experienced. It is an unexpected feeling to have when reading a book, but one, if you are expecting, I think you can embrace and enjoy. This entry was posted in Novel, Review and tagged Christopher L. Bennett, Forgotten History, New Frontier, Peter David, PopArtsPlace, Schuster, Simon & Schuster, Simon and Schuster, Star Trek, Star Trek The Next Generation, Star Trek TNG, Watching The Clock on July 11, 2014 by A Novel Approach.